Home The team Contributors Emulators Wanted Play online! 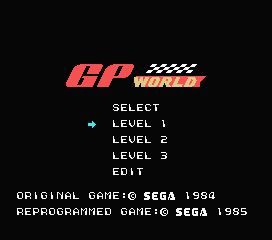 This is the SC-3000 Survivors review of the game cartridge ROM manufactured by SEGA for the SC-3000 and SG-1000 systems, compatible also with SEGA Master System and SEGA MarkIII. This is the cartridge box released by Grandstand. This is the cartridge box released by John Sands. This is the cartridge box released by SEGA. In this game, the player is required to repeatedly "think" and "take action" to go through and clear the maze scenes by solving their mysterious riddles while averting the enemy's guards, who are relentlessly in pursuit of him. After collecting all of the gold chests, you must come up with new fresh ideas in order to successfully challenge the next level scene. Although your experience gained from the previous play action will help you overcome some of the future maze scenes, you still have to be constantly on the alert. You can also enjoy creating your own games by using the keyboard. This is an intriguing game which requires intellectual depth to skillfully, maneuver the unknown maze structures that consecutively develop one after another. Some screenshots taken from the gameplay. 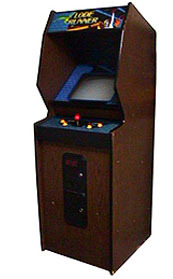 The exciting, dramatic arcade version of the 1984 computer game of the year, Lode Runner comes with a built-in player base. It's already a smash arcade hit, dominating "top ten" charts in Japan for the last eight months!! Lode Runner... More strategy and a virtually endless variety of play mean top earnings and long, long loca­tion life. 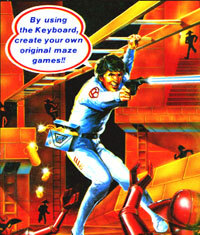 Lode Runner... Blasting the way into a new era of video game excitement!!! Player is a galactic commando, dispatched deep into the underground flannelling empire where great quantities of treasures of gold which have been stolen from bun gelling people ore stored. The object of the game is to collect all those treasures scattered in various places on the 24 different levels (or screens) while avoiding deadly bun gelling guards armed with a loser pistol to blast holes on the brick floor, the player must trap the pursuing guards in the holes while digging tunnels, scaling ladders, and shimmying across ropes in pursuit of the mothriode. A player successfully captures all the treasures on a level, the escape ladder leading to the next level appears. A "buy in" continuation feature allows a player to continue at the same level where the game has ended (or to start a new game from the first level) in 2-player mode, the game offers the choice to either player as each players game expires. That enables one player to keep going while the other starts his game over again. Some screenshots taken from the arcade gameplay. ©2008-2019 www.digimorf.com. All Trademarks belong to their owners.